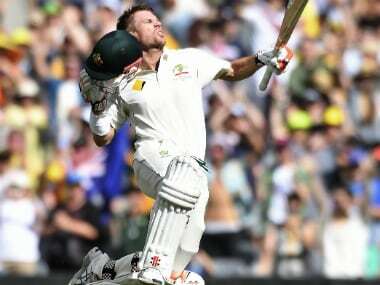 Melbourne: A run-a-ball hundred from David Warner gave Australia an outside chance of forcing a result after Azhar Ali posted a double-century for Pakistan in the second Test in Melbourne on Wednesday. Warner smashed 144 off 143 balls in a pulsating 198-run stand with Usman Khawaja to cut Pakistan's lead to just 165 runs with two days to play. Azhar posted the highest score by a Pakistan batsman in Australia with an unbeaten 205, before a declaration on 443 for nine just after lunch on the third day. By stumps, the home side had given themselves a chance of getting a lead to put the pressure back on the Pakistanis after rain had disrupted the opening two days. Usman Khawaja was gunning for a century on 95 with skipper Steve Smith not out 10 as Australia reached 278 for two off just 58 overs at a rate of 4.8 runs an over. Warner plundered his maiden century in a Boxing Day Test at the MCG and his 17th Test hundred overall. "It was sort of my bogey venue. Taking momentum from the one-day hundred I scored here, to hit my first Test one took a weight off my shoulders," Warner said. "We've got to assess conditions tomorrow, we've got a lot of time left so we have to make the most of it." The left-handed opener survived a big moment on 81 when he was bowled by Wahab Riaz with a searing 150 kph inswinger after tea, but it was called a no-ball for over-stepping. Riaz finally got Warner 63 runs later when Hot Spot and Real-Time Snickometer found a faint brush on his glove and he was given out on review to a legside catch behind. Warner's innings contained 17 fours and a six and his 198-run stand with Khawaja came off just 214 balls. Azhar earlier overtook the previous highest Pakistan Test score in Australia -- Majid Khan's 158 posted in Melbourne 44 years ago. "I came with lots of hope that I could deliver here for my team and I'm very ecstatic about it, and I hope it can help my team get a result in the game," Azhar said. "I think as the game goes on reverse swing will come into play. The game is very open after the way the Australians came out. "We need to come back in the morning and get some wickets and take it from there." Skipper Misbah-ul-Haq called a halt upon the dismissal of Riaz, leaving Azhar unconquered off 364 balls in almost 10 hours at the crease spread over three days. Azhar batted on after going to lunch on 196 but partner Sohail Khan was run out on his lunch score of 65 off 65 balls. 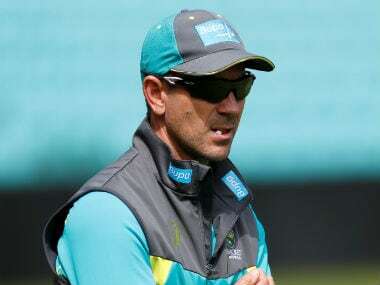 The pair plastered the Australian attack in a stand of 118 as the tourists set up a declaration, which came after Riaz skied Hazlewood and was caught and bowled for one. It was Azhar's 12th Test century in his 56th Test and third against Australia, swelling his aggregate for the calendar year to 1,155 runs at 64.16. In October Azhar joined a select club of batsmen with an unbeaten 302 against the West Indies in Dubai and became the first batsman in day-night Test cricket to achieve a triple century. It was also the fourth triple hundred by a Pakistani batsman. Mohammad Amir was out in the first session, caught down leg-side by wicketkeeper Matthew Wade off Mitchell Starc for 29 off 27 balls. Sohail Khan slammed four sixes off spinner Nathan Lyon to reach his best Test score before he was run out when called for a quick single by Azhar. With the dismissal of Riaz, Hazlewood claimed his 100th Test wicket in 25 Tests at an average of 25.79.